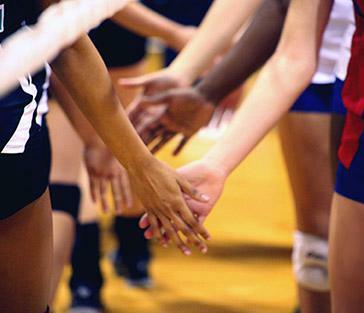 Willowbrook is the only sports complex in Houston dedicated purely to volleyball. In fact, Willowbrook was originally built with its future volleyball players specifically in mind. Today, we continue to pursue excellence and innovation, from the big picture down to the smallest details. Our advantages become your advantages, now and in the future. Those three words summarize our focus. Our goal is to foster faith, encourage family involvement, and establish life-long friendships. Specially designed flooring for injury prevention. Separate “tournament flooring” area to give players the chance to practice on typical tournament surface, without subjecting them to the disadvantages of playing on that surface full time. Strategically placed lights with anti-glare technology keeps players’ eyes healthy during and after play. Performance Training Area dedicated to supervised strength, speed, agility, and coordination training. Willowbrook has partnered with OLLIN to provide the best athletic performance training and medical support available. We place a special emphasis on keeping our players healthy and strong as they grow into top-quality athletes, as well as building each one’s potential. Through the fun, focused training provided by OLLIN, each player is given the tools and techniques to move faster, jump higher, and and improve her endurance. In the event of an injury, our players have access to an on-site registered physical therapist and supervised medical rehabilitation. Willowbrook and Asics have formed a strategic partnership to promote girls’ volleyball in the Houston Area. Willowbrook is one of only five volleyball clubs in the country to receive the prestigious Asics designation. Through our partnership, Asics is able to support great girls’ volleyball programs, and we are able to offer official Asics brand volleyball gear at competitive pricing in our Pro Shop. Additionally, we are able to work directly with Asics to supply uniforms and volleyball shoes for schools, clubs, and other teams. Contact Lizzi Piercy for more information.